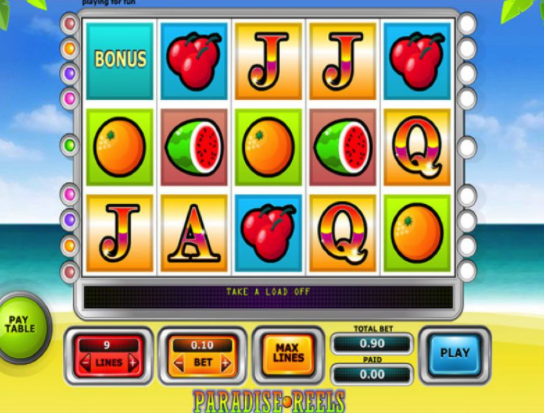 Enjoy the sun on your back as you spin the wheel on this traditional fruit machine classic. 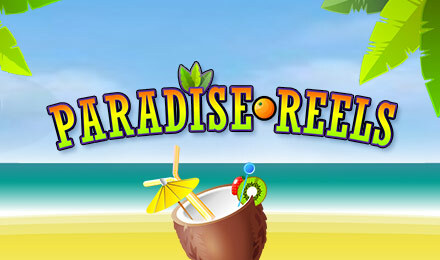 Paradise Reels is a tropical adventure through online slots uk, 5 reels, and 9 paylines of sun, sea and sand. This slot game features all the familiar icons of slot history; the plush cherries and juicy watermelons but does not forget to throw in some sweet bonus rounds. Learn more about mobile billing slots. Over the years, Eyecon has maintained a strong and key part to the casino industry. They are regularly complimented on their ability to consistently deliver fresh content to their players. As a result, they have become firm favourites in the casino industry, delivering excellence every time. aside from their software development, they have also become top dogs in the behind the scenes aspect to the casino industry too. This includes attentive and responsive account management, which makes them appealing to other big names in the Casino industry. In Paradise reels, Eyecon take us away from our everyday realities and transform our surroundings to sun, sea, and sand! Click here for a full list of Easy Slots games. Why would you want to go on holiday when you can do the same in the comforts of your own home without the inevitable screaming children, hot weather, and petty arguments with the family. Paradise reels eradicate all of this and brings you the atmosphere of a holiday with the bonus to win cash prizes – could you ask for anything better? Starting at just 1p bet per spin to £10, this game truly wants you to enjoy the entertainment aspect and take it easy whilst you are transported to a paradise that only dreams can conjure, until now! Paradise Reels structures itself around a 5 reel and 9 pay line system. The symbols in this game have taken the form of fruits, including watermelons, oranges, and cherries, followed by a mouth-watering kiwi and a creamy coconut that you will want to sink your teeth into as it is the bonus icon. The letter A is the symbol you want to keep an eye out for as this brings in the 5,000 jack-pot, at the condition you get 5 A’s in the reel. Unfortunately, if you only match 3 or 4, you will receive a significantly smaller figure of 100 or 1,000. Cherries may have been your best friend in the traditional machine slot-games but not here, as 3 of them will only get you an inadequate 9 credits. The wild card is represented by a succulent guava and, like any other wild, it removes and replaces all tiles apart from themselves and the bonus. Additionally, any wins made by the wild will be doubled. 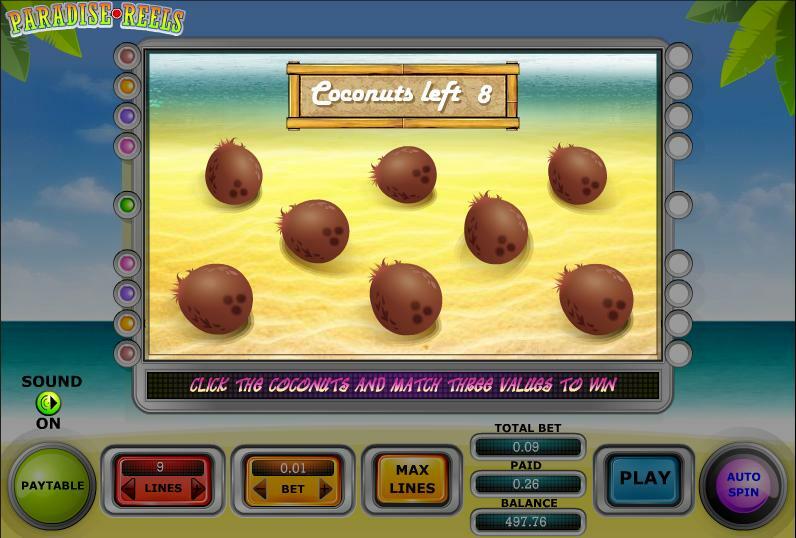 However, what is slightly different with this game is once you reach a bonus round, you will be flown to a new window where you’ll have 8 coconuts to crack open in the search for 3 matching values. To learn more about the uk slot promo we have on offer click here. This relaxing casino slot-game is perfect for quick get away without the hassle that comes with a holiday. With the minimum bet starting at just 1p too, the game is certainly worth a try, considering you wouldn’t be able to get a bus ride to your nearest town with a penny – Paradise Reels jets you off to a whole new destination! An equally sweet game for you is our Fiddle Dee Dough, visit the site today.